However, when the men reflect on their farming practices…. SOUTH DAKOTA SOIL HEALTH COALITION (SDSHC), Pierre, S.D. January 31, 2019- The South Dakota Soil Health Coalition hosted their third annual Soil Health Conference January 22-23, 2019 on the campus of South Dakota State University in Brookings. Attendees traveled from throughout the upper Midwest to learn about opportunities to improve soil health. Industry leaders including Keith Berns, Dr. Allen Williams, and Dr. Dwayne Beck shared powerful, engaging presentations that…..
SOUTH DAKOTA SOIL HEALTH COALITION (SDSHC), Pierre, S.D. December 7, 2018- The SDSHC is extremely pleased to announce the three speakers who will be showcased at the 2019 Soil Health Conference and Annual Meeting, January 22-23, on the campus of South Dakota State University (SDSU). Keith Berns of Green Cover Seed will speak both the evening of the 22nd as well during the main event the following day. Additional keynote speakers include Allen Williams, Livestock Management and Agricultural Consultant, and Dwayne Beck, Research Manager at Dakota Lakes Research Farm. All three of these speakers are well known for their many contributions to…..
SOUTH DAKOTA SOIL HEALTH COALITION (SDSHC), Pierre, S.D. July 5, 2018-Momentum for the soil health movement in the state of South Dakota has been increasing at an extremely encouraging rate this year. Over sixteen different events have already been held throughout the state with…. SOUTH DAKOTA SOIL HEALTH COALITION (SDSHC), Pierre, S.D. May 17, 2018- A Soil Health Road Show has been scheduled for June 12-13, with events being held in four different locations throughout central and eastern South Dakota. Each event will feature nationally recognized soil health speaker Ray Archuleta as well as additional soil health specialists from the state and region. Archuleta is a farmer from Seymour, MO who teaches…..
For those who know her as the Garden Lady, it may come as a surprise to learn Donna Adrian didn’t always enjoy gardening. In fact, “chore” is the nicest word she used to use, to describe the task. “My parents always had a big garden, so I grew up gardening. It was a lot of hard work hoeing the hard ground to get rid of weeds,” she explains. 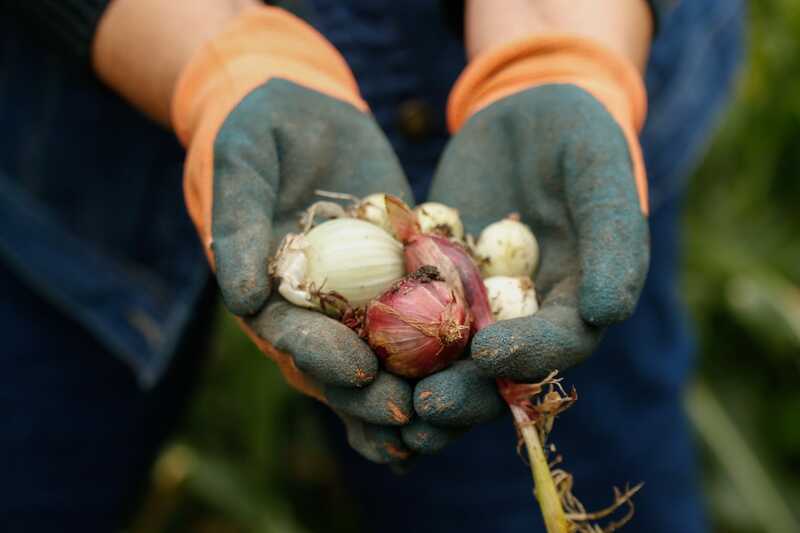 When it came time for her to plant her own garden, Adrian began looking for easier methods…..
SOUTH DAKOTA SOIL HEALTH COALITION (SDSHC), Pierre, S.D. September 21, 2018- The 2018 Soil Health School, held near Salem, SD, with hosts Kurt and Kathy Stiefvater drew a record number of students and included soil health and agricultural experts from across the state. 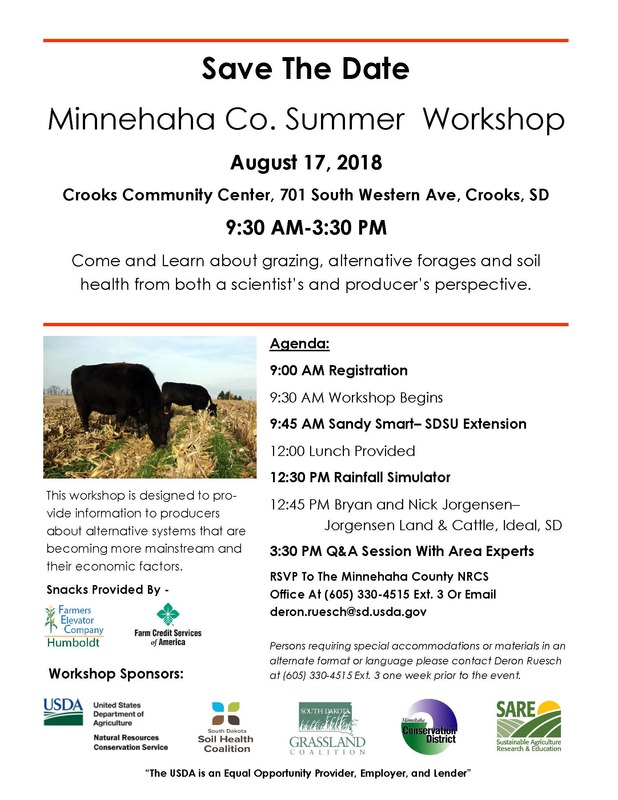 This annual event is designed to give participants a comprehensive understanding of…..
SOUTH DAKOTA SOIL HEALTH COALITION (SDSHC), Pierre, S.D. February 26, 2018-The South Dakota Soil Health Coalition (SDSHC) is pleased to announce the appointment of three new members to serve on the organizations governing board. Jason Kontz of Colman, SD, will fill the vacant seat of previous board member Al Miron who sadly passed away in November of 2017. Shawn Freeland of Caputa, SD and Mike Beer of Keldron, SD will fill……. SOUTH DAKOTA SOIL HEALTH COALITION (SDSHC), Pierre, S.D. December 19, 2017-The South Dakota Soil Health Coalition (SDSHC) will be hosting three regionally recognized speakers at their annual meeting January 17, 2018. Joe Breker and his wife Patty farm 2500 acres in Sargent County, North Dakota on which they raise corn, soybeans, cereal grains as well as an ever-changing variety of specialty crops. The Breker Farm was the recipient of…..
SOUTH DAKOTA SOIL HEALTH COALITION (SDSHC), Pierre, S.D. December 1,2017-The South Dakota Soil Health Coalition (SDSHC) will be hosting their annual meeting at the Lake Area Technical Institute,1201 Arrow Ave. N.E., Watertown, January 17, 2018. Registration will begin at 9:00 a.m. with the full program to begin at 9:30 a.m. Speakers for this year’s event include David Brandt Ohio soil health pioneer, Allen Williams cover crop and livestock integration expert and Joe Breker North Dakota soil health advocate…. SOUTH DAKOTA SOIL HEALTH COALITION (SDSHC), Pierre, S.D. 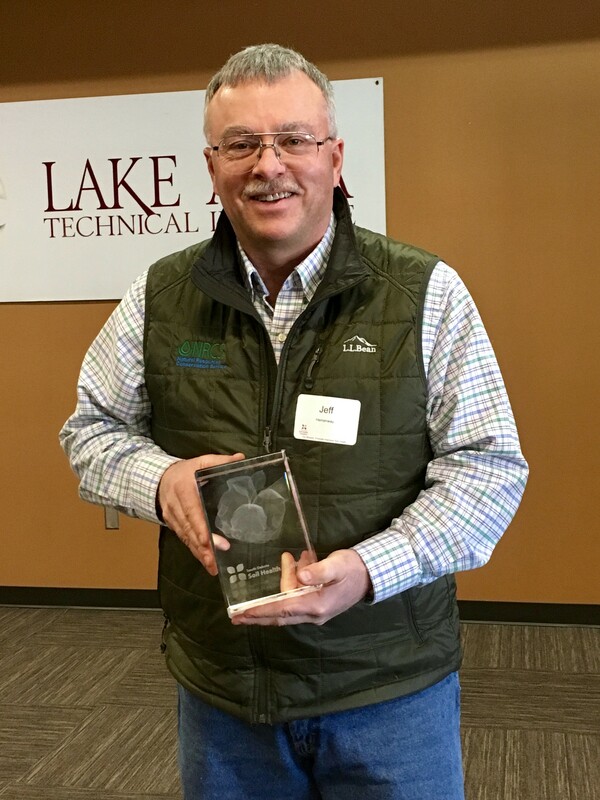 February 25, 2019- Winners of both the annual “Friend of Soil Health” and first ever “Legacy Award” were announced at the 2019 South Dakota Soil Health Coalition (SDSHC) soil health conference and annual meeting. The “Friend of Soil Health” award was created to recognize those who have made a substantial and lasting impact in the areas of soil health education and……. SOUTH DAKOTA SOIL HEALTH COALITION (SDSHC), Pierre, S.D. 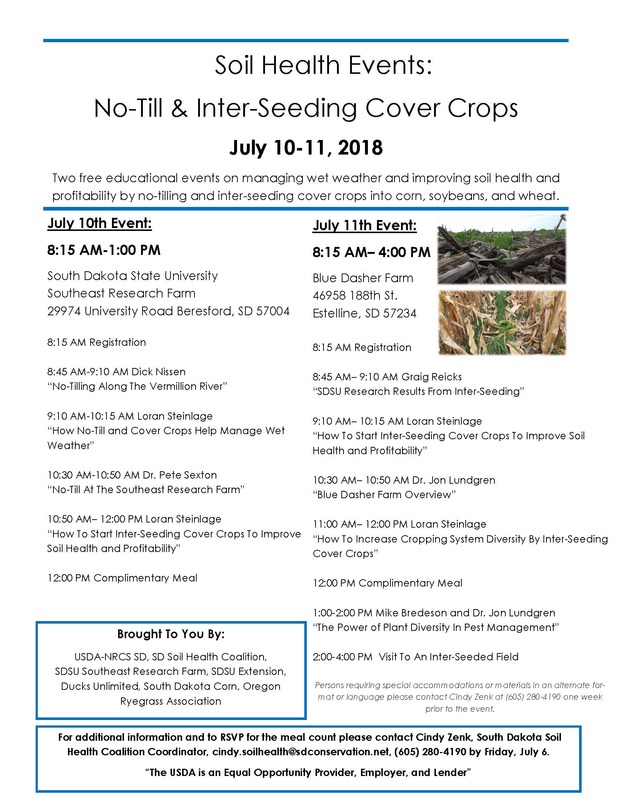 June 26, 2018- Two free educational events on managing wet weather and improving soil health and profitability by no-tilling and inter seeding cover crops with corn, soybeans, and wheat will be held on Tuesday, July 10, and Wednesday, July 11, in eastern South Dakota. The event on July 10 will run from 8:15 AM through 1 PM at…. SOUTH DAKOTA SOIL HEALTH COALITION (SDSHC), Pierre, S.D. January 24, 2018-The South Dakota Soil Health Coalition (SDSHC) awarded its first ever South Dakota “Friend of Soil Health” award at their second Annual Meeting held January 17, 2018. The recipient was retired Soil Health Specialist Jeff Hemenway who was honored for his decades long work advocating for improvements in soil health and soil health management throughout the state of South Dakota. As the key organizer of the SDSHC’s first Soil Health School he established a means for a holistic learning experience that has proven to make a real impact on all those who take part. Hemenway’s soil health message has convinced…. SOUTH DAKOTA SOIL HEALTH COALITION (SDSHC), Pierre, S.D. December 4, 2017-The South Dakota Soil Health Coalition (SDSHC) has recently hired Sarah Fitzgerald as Communications Coordinator to assist in promoting soil health best management practices across the state. Originally from Illinois, Fitzgerald attended Augustana College, in Rock Island, where she majored in Biology, Environmental Studies and Geography. Her work background includes….